We currently have these grey metal cafe chairs for sale. These grey metal cafe chairs have an industrial metal design which will win you over with its simplicity and its robust nature. In true cafe style, these chairs have a flat seat and a slightly inclined backrest for better posture. They are perfect for indoor or outdoor use. If you would like further information about these chairs, including estimated cost and delivery options, please get in touch with our sales team by calling 07944 508282. If you are viewing our website using any type of Mobile Device, you can get straight through to our sales team by clicking on our Telephone Icon shown at the bottom right hand side of your screen. Alternatively, if you are unable to call us, you can enter your details into out ‘Request a Quote Online Form‘ and one of our sales team will be in touch very soon. 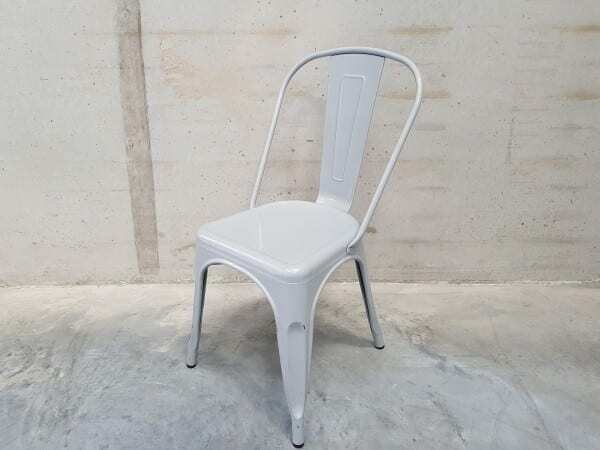 If these chairs are not exactly what you are looking for, we have other Second Hand Cafe Chairs currently in stock, which you can view by clicking on the link provided.